In 1985, a group of highly committed Chester County attorneys recognized a growing gap between the legal system and the citizens it serves. 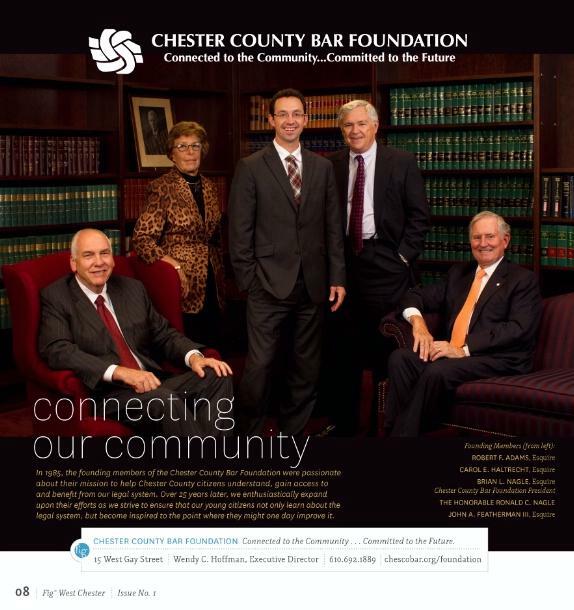 In an effort to re-connect the community with our laws, those lawyers came together to form the Chester County Bar Foundation. The Foundation's goal, then and now, is to fund initiatives which strengthen the ties between the residents of Chester County and the justice system. In the new millennium, the Foundation's Board of Directors adopted a new mission, which highlights the role of the Foundation in reaching out to the public in many expanded ways. That mission — to help Chester County citizens understand, gain access to and benefit from our legal system — simply clarifies what has always been the role of the Bar Foundation. With its focused mission, the Foundation took a giant leap forward in its efforts to raise funds through the Foundation Golf Classic and Art Auction. With the advent of these fundraising events, the Foundation doubled its endowment and increased funding for programs. Programs supported by the Foundation include: Legal Aid of Southeastern Pennsylvania, Law Related Education for Youth program, Elder Law Education programs, Charles E. Swope Scholarship and Matching Grant program, Domestic Violence Center of Chester County and the Crime Victims' Center of Chester County. Over its history, the Foundation has become a force within the community by helping people of all ages and backgrounds understand the legal process and their rights as citizens of Chester County. Through organizations such as Legal Aid of Southeastern Pennsylvania, the Chester County Bar Foundation directly contributes to organizations who provide those less fortunate in Chester County with free legal representation. We support DVCCC's commitment to empowering survivors of domestic abuse through providing information and supporting them as they reclaim their lives. DVCCC provides services in confidential locations throughout Chester County. We support CVC's efforts as they strive to support and empower victims of crime and their families through a comprehensive range of services. CVC's Prevention/Education Program strives to increase awareness of violence and its impact on victims and the community. Since 1947, Family Serves of Chester County has been providing community members with professional and affordable human services. Their mission is to promote the well being of families and individuals and to advocate for change. Many hard working Chester County residents earn too much to qualify for a free Legal Aid lawyer, yet cannot afford the high cost of hiring a private attorney. The members of the Chester County Bar Foundation and the Chester County Bar Association recognize this challenge and offer a solution with the Access to Justice program. This program provides free legal services to the working poor in Chester County and is the only program of its kind throughout the state of Pennsylvania. Since 1988, the Foundation has funded a program where Chester County attorneys donate their time to go into both elementary and secondary classrooms to teach students about the law. Over the past 25+ years, over 45,000 students have been educated in various areas of law in grades 2 through 12. Adults frequently find themselves in situations where some knowledge of their rights under the law is essential. The Bar Foundation has historically funded the People's Law School, which educates adults on different areas of the law including wills and estates, business law, family law and real estate law. The Foundation scholarship was established in 1992 to provide financial assistance for post-high school education in law or law related fields. Scholarship applicants must have demonstrated academic excellence and outstanding community citizenship. Click here for more information. As part of the annual scholarship award, recipients are given the opportunity to help choose a charity to which the Foundation will award a grant that matches the scholarship amount. Groups eligible to receive the grant include Community Impact Legal Services, the Crime Victims' Center of Chester County, Domestic Violence Center of Chester County and Legal Aid of Southeastern Pennsylvania. Summer internship program designed for first year law students who self-identify with those groups historically discriminated against on the basis of disability, gender, race, enthnicity, sexual orientation, gender identity, and/or gender expression or who otherwise comes from a disadvantaged background. This clinic helped over 40 homeless and low-income residents obtain their birth certificates.Volunteers from our Bar Association sat down with applicants and filled out birth certificate applications with each person. This program is very helpful for the homeless who are often left without funds or know-how to apply for a copy of a birth certificate. This three-day event is for students on Mock Trial teams in Chester County to compete in a county-wide competition. The winner of this competition moves on to the state competition. Bar Association members volunteer to sit as an imitation Judge and jurors. This program allows students to experience trials as true attorneys.